Unsponges® are made from a blend of natural and synthetic rubber for all cleaning uses. 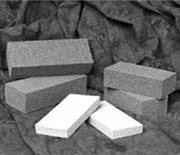 Unsponges® are used dry and are especially effective in removing smoke from walls, ceilings and other surfaces following smoke or fire damage. An exclusive odor counteractant is built into the rubber for simultaneous cleaning and deodorizing. Durable Unsponges® may be washed and reused again and again. A versatile and handy tool for the restoration professional.